When ETH is sent, the receiving address can perform arbitrary computation that is paid for by the originator of the transaction. Now it is emerging that some exchanges that initiate transactions without gas limits were open for exploitation in a flaw picked out by Level K—a group of researchers that specialize in dApp development, Trail of Bits and IC3. While decentralized exchanges are immune since the user—and not the exchange, initiate transaction, centralized exchanges with no limits on gas were most likely hit by hackers. Successful exploitation could see exchanges pay high transaction fees for every transaction made. Meanwhile naïve users would pay extra Gas for transaction made. As exchanges took step to prevent further drains, Vitalik Buterin is holding through a $470 million paper loss. According to data from Etherscan, the young founder hodl 355,000 ETHs and with 187 trxs related to the account, he is one of the few holders unmoved by the market turbulence. Instead he is focusing on platform development. The market has so far crashed from highs of $1,400 and from candlestick arrangement, it is likely that ETH might sink below psychological $100. At spot prices, ETH/USD is down 30 percent in the last week and down nine percent in the last day. The path of least resistance is southwards. As long as ETH is trending below the main resistance line of $160, bears are in charge. After Nov 19 break below $160, it has been a one-way drive as sellers step up wiping out $5.1 billion of Ethereum market cap—from $16.1 billion to $11 billion. But the recent collapse was set in motion in early August. Now, after three months of consolidation and attempts of higher highs, ETH/USD is now in a free fall, crashing bulls and discouraging participation. There are three bars that are of importance as far as our ETH/USD price analysis is concerned: Aug 8 bear bar closing below $350—307k versus 143k average, Sep 5 crashing through $250 support with 594k versus 207k average and lastly Nov 19 bar closing below our main support line—now resistance at $160 with 931k versus 324k average volumes. From this we can note that participation is high as prices tumble below key support lines. It could get worse because bears are not slowing down. Through panic sells, odds are increasing supply, could see ETH close below $100. Thing is ETH/USD is bearish and trading within a bear breakout pattern confirming losses of Sep 5 and Aug 8 as mentioned above. It’s not hard to see why the floors are not visible for ETH. The last few days has seen ETH collapse in a new perpendicular manner with virtually no support. Sellers are firmly in control and for coin hodlers liquidating at spot prices, then it’s a +85 percent drop from 2017 highs. Unless otherwise, selling at spot won’t make sense unless of course prices would sink to $2—and we cannot discount that possibility when we map out this from the weekly chart. 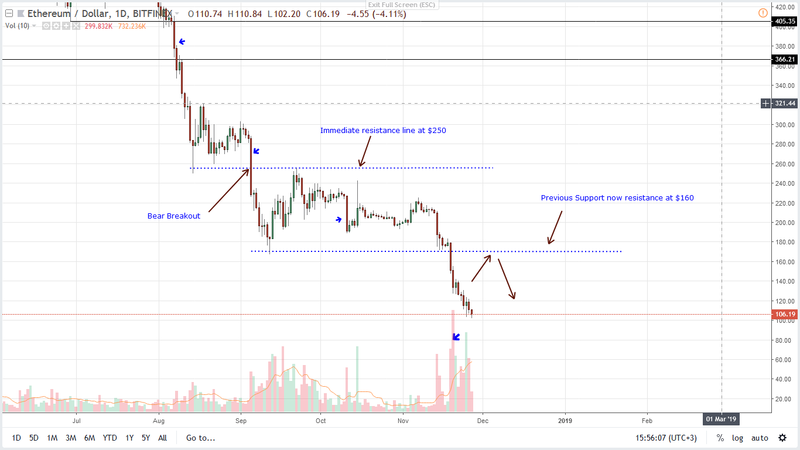 The faster the recovery the better for ETH valuation but before prices edge and satisfactory close above $160, we shall retain a bearish outlook. You are technically wrong to state that Vitalik Buterin is sitting on a $470 Million Paper Loss. He acquired his Ethereum when it was at much lower prices and would still be sitting on a profit even if it went to $1.